Equine repro ultrasound is one of our primarily specializations, and we would love to have the opportunity of helping you determine the best ultrasound solution for your mares. 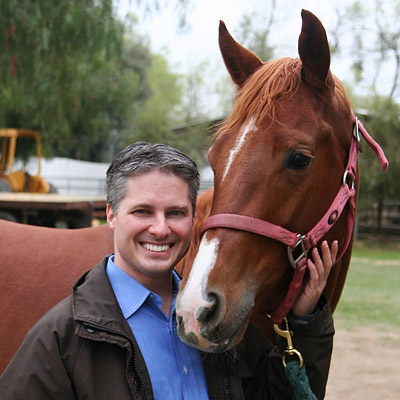 Interested in Equine Ultrasound, and Comparing Us With Other Dealers? NEW! Optimizing the CTS-3300V+ Training! * Note: You may of course also simply purchase the ultrasound alone, without our full package, at a lower price. You have the option of either buying the ultrasound alone at one price, or buying the full package at a higher price, or even of picking and choosing among what you would like to add or take away. Just give us a call and we can tailor a package precisely to your needs. 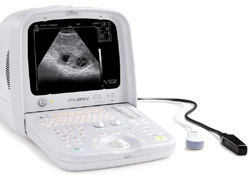 The new CTS-3300V+ Ultrasound from SIUI, with its wide-range of available probes and built-in calculation packages, has become our best-selling portable veterinary ultrasound, especially in equine reproductive applications. Indeed, we have never seen anything like it. 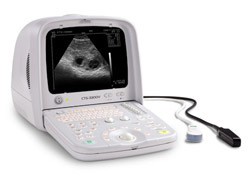 Up until 2008, our best-selling equine system was the old CTS-200V+, with its 6-inch screen and its single-frequency probe, completely without cineloop or any easy way to transfer images to a computer. Yet it was STILL tremendously popular! Everyone still loved it. For its price, there was nothing else on the market that came close. Then the new CTS-3300V came out, and closely on its heels the even newer CTS-3300V+. And everything has gotten much, much better still. With the CTS-3300V+ you have a larger screen, a multi-frequency probe, cineloop (which enables you to capture an image and then back up in time to the very bet frame), internal image storage and even a USB drive for moving images easily to a computer. If the CTS-200V+ was good, this one is extraordinary. What contributes most to the image quality on the CTS-3300V+? USB drive for external storage. Give us a call at 800-839-0722 or fill out our short Inquiry Form at the top of this page to get more info on our Equine Ultrasound. "I just wanted to let you know, you guys have done a top notch job, and I am very, very impressed with your service and your educational support and the machine. You have been a HIGHLY pleasant company to work with, and I am going to continually recommend you to everyone I can. Thank you again for such an outstanding bang-up job. I have nothing but the highest regards for you. Thanks again."